Three young men on a self-made boat, rafting 2.200 km down the Danube – spreading smiles in hospitals along the way! They are old friends, their creed is adventure and they are known to insiders as the “Challengers of the East”. In 2015, their last adventure took them in a Skoda Favorite all the way to Mongolia and back – 22.000 km! They wrote a book about it. Now they’re back and ready for a new challenge. Oliver, Jakub and Vasek couldn’t be any more different: Oliver, an art blacksmith, who’s in his spare time a hospital clown with Chance 4 Children’s Dr. Clown project; Jakub – he’s working toward his PhD in Chemistry and Vasek is a 3D printing developer. 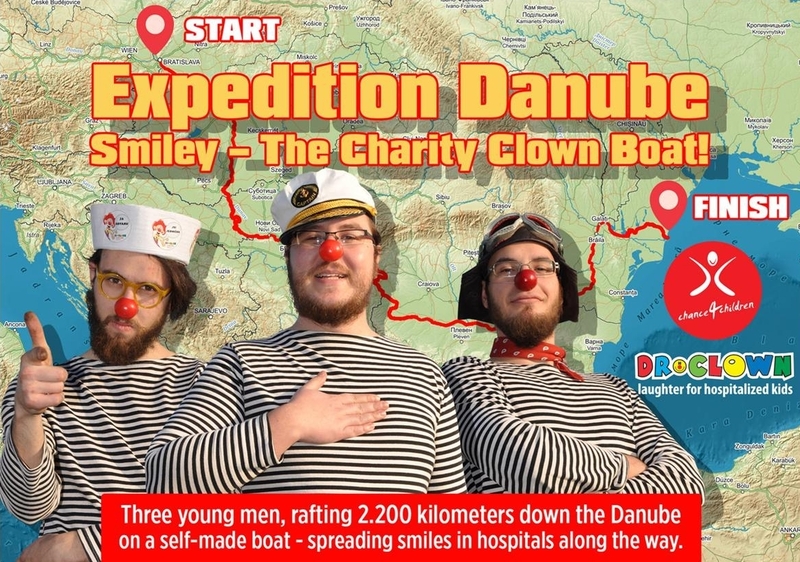 Kicking off their 2.200 km journey down the river Danube in their home-made raft “The Smiley” , the team aims to raise awareness and needed funds for the plight of hospitalized children in Central Europe. Embarking on the 30th of June at Gabcikovo Dam in Slovakia, they hope to reach Constanta, Romania, and the Black Sea by July 20th. 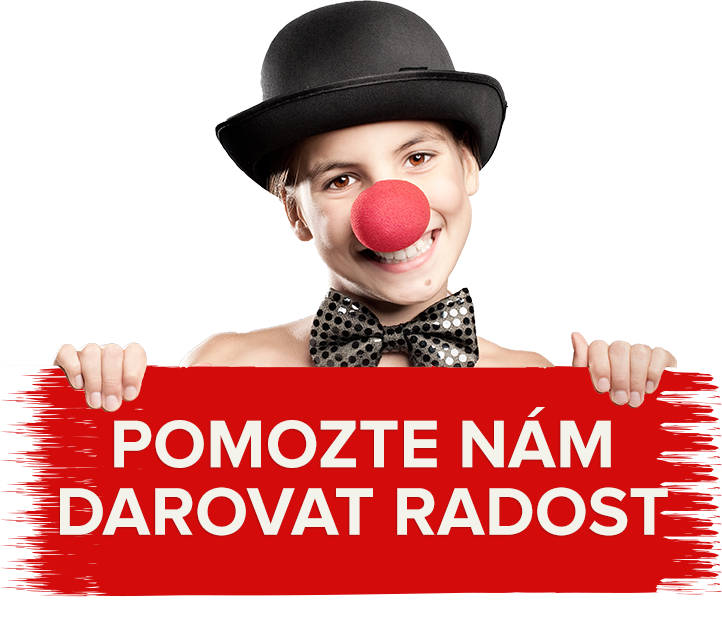 On their way downstream, they’ll be stopping over in major cities hugging the banks of Europe’s second largest river, to bring Dr. Clown’s “Smile Therapy” to children fighting serious illnesses and the “Hospital Blues” in hospitals in Budapest, Belgrade and Constanta. “On our first trip to Mongolia, even though it was fun and adventurous, there was an element missing – something to give it meaning“, comments Oliver. “I think this is what makes our Expedition Danube different – it really serves a purpose!” It was Oliver’s engagement as a clown on the Dr. Clown team, which lend the idea and impetus for Expedition Danube. To make their journey a success and help them reach their goal to raise 500.000 CZK (20.000 Euro) for the Dr. Clown initiative, the team is looking for sponsorship and partners: Media Partners, individual sponsors, corporate sponsors, a title sponsor, country sponsors and sponsors of the day for each day of their journey. The team would also like to extend a special “Thank You” for the generous contribution the Spartan Charity Race franchise made to their journey. Because of this, the Challenger Team and the Smiley were able to stop over and bring smiles and joy to critically ill children in hospitals in Bratislava, Slovakia, and in Budapest in Hungary. Click here and scroll down to see the pictures. Thank you, Spartan!! Click here to read about C4C and Spartan. Thank you for helping us to make a difference in the lives of children less fortunate than our own! For more than 20 years, the C4C has helped children who have not been as lucky as others and gives them a chance to succeed in life.